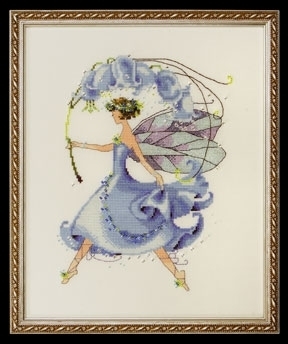 Cross stitch chart by Nora Corbett Designs (Mirabilia Designer). Uses: 862101 Antique White Jobelan 32ct; 429101 Antique White Jobelan 28ct; 65110 French Lace Linen 32ct; 355110 French Lace Aida 16ct; Mill Hill Beads: (#of pkgs) 02031 (1), 10113 (1), 16010 (1) 16168 (1), 18830 (1); Kreinik #4 Braid: 015, 080hl, 093, 1223, 1432; Caron Waterlilies 204. **Approximate size 6.7"W x 9.3"H. You may want to try YLI's Wonder Invisible Thread to attach beads. Search for WT212.